Yesterday was the annual Herbs Galore & More at Maymont in Richmond, VA. Absolutely one of the highlights of my year. I did some serious damage. Oh, I wish I’d been there to go with you! Love my herbs! You are my kind of gal. 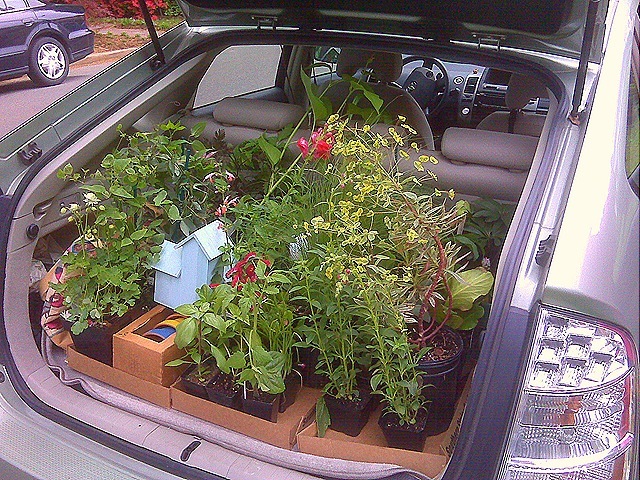 I worked in the yard today and can’t wait to fill in the bare spots…I need to fill my trunk like you did! Now time to plant…. Excellent job Suzy….I would expect nothing less…can’t wait to see the pictures of them in the garden. Did you get anything unusual or exotic? Looks like you got some good stuff. I love when it’s time to put out plants. By the way, I love your banner. Stopping by to catch up! I can’t wait to get in the yard. Looks like you will have fun planting! Have been following along for awhile. I love your painted shed. I wish I could paint mine, but it’s metal. Oh well-I’ll just enjoy looking at yours. Oooh, I look forward to meeting your new “friends”. OMG I missed it!! What a great day you had! let me go check out what else you’ve been doing!